You may receive a refund for stock items returned in original “new” condition as long as Hileman Silver Jewelry receives the item within 10 days of the purchase date. 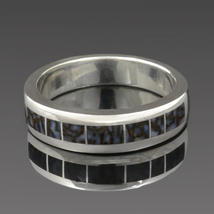 Made to order rings, special order sizes and special inlay requests are not returnable. Stock items returned after 10 days will receive a merchandise credit. Items are not returnable for any reason after 14 days unless arrangements are made before purchase. Shipping charges will not be refunded. Items are inspected before being shipped from our studio. If you receive an item damaged during shipment, save the box and notify the carrier of the damages. If you notice a defect in the jewelry, contact us for return instructions and we will repair the defect, replace the item with a new one or refund your purchase price if we are not able to fix it. We cannot warranty our products due to the varying wear and tear based on customer activities and care. Our jewelry can last a lifetime when worn with common sense and removed before activities that could damage it. 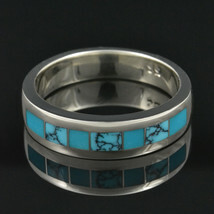 Dinosaur bone man's ring in sterling silver by jewelry artisan Mark Hileman. The handmade dinosaur bone ring is inlaid with 2 different kinds of gem dinosaur bone- red-orange with black matrix and reddish brown with grey matrix. This gem dinosaur bone inlay ring measures 6mm wide and will be custom made in your exact ring size in 3 to 5 weeks. Just include your ring size, phone number and due date in the "Note to Seller" box when ordering. 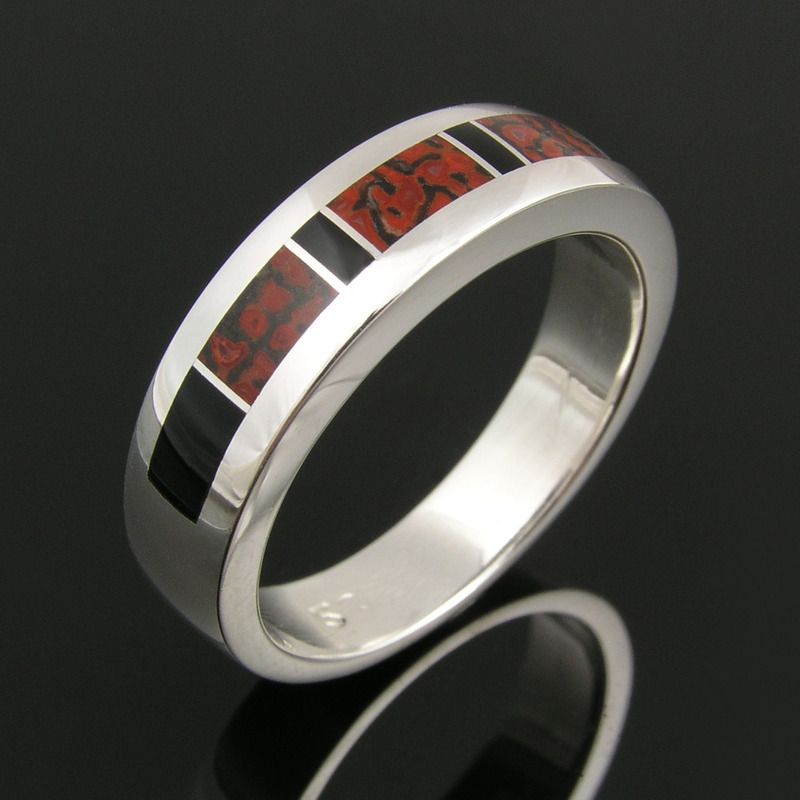 The ring may also be special ordered in other inlay stones or in 14k gold with delivery in 3 to 5 weeks. Contact me for a price quote. Photos 2, 3 4 show other inlay options. This Utah dinosaur gem bone came from the Colorado Plateau and was a living animal during the Jurassic Period around 144 to 208 million years ago. 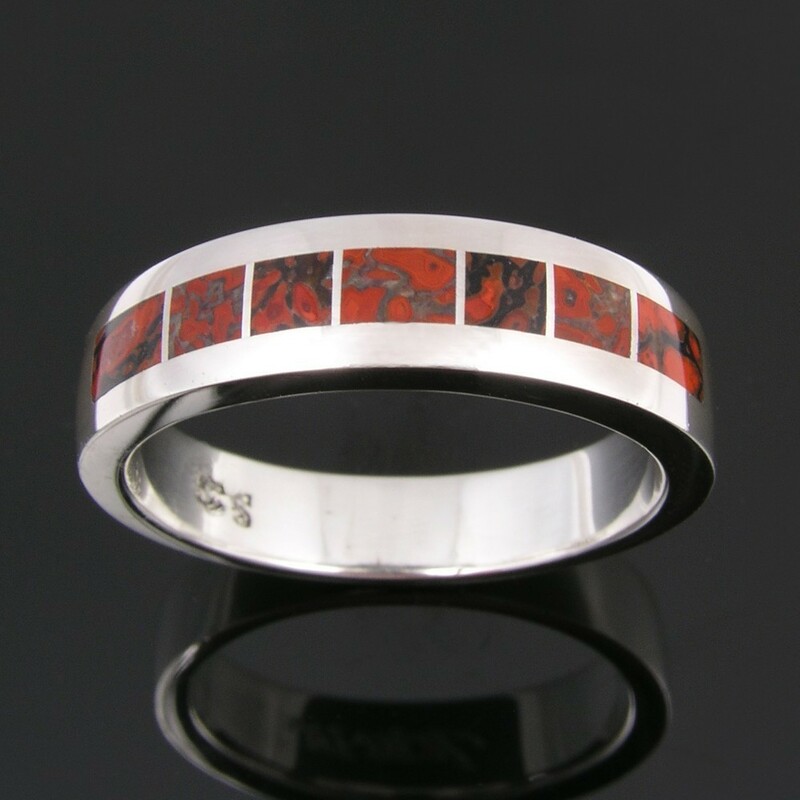 The dinosaur bone we use in our silver jewelry is usually referred to as “gembone”. It is actually not dinosaur bone but is a combination of minerals that replaced the bone structure over time. Dinosaur bone is found in a rainbow of colors with the webbing color and cell size varying greatly from piece to piece. 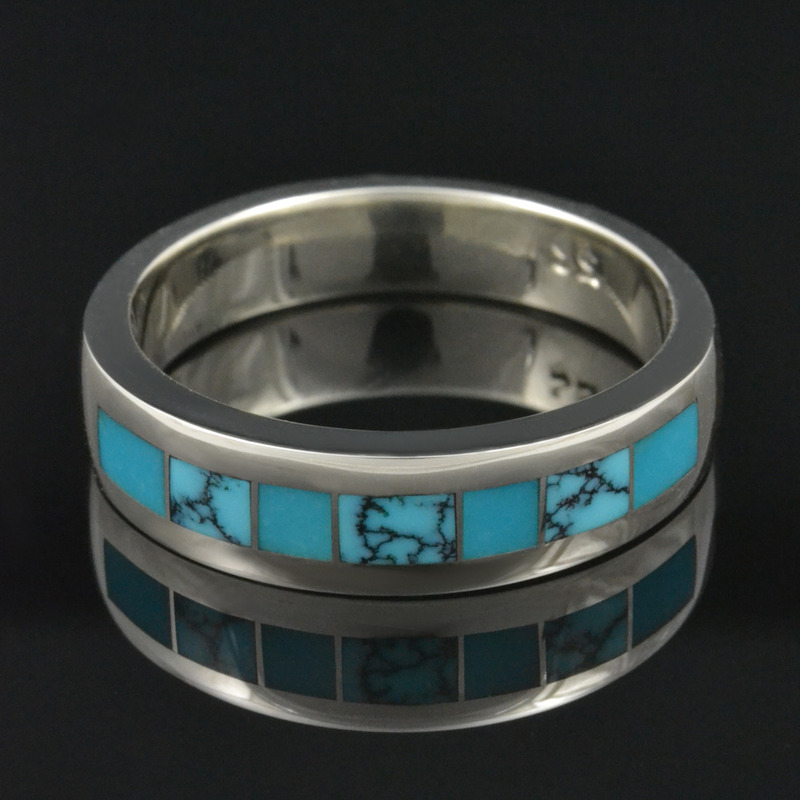 The varying cell size and colors create some truly unique patterns and virtually one of a kind pieces of dinosaur bone jewelry. The fossilized dinosaur bone can be composed of many different minerals including agate, jasper and calcite. The gembone color is determined by the combination of minerals present when the fossilized bone formed. Some colors are more rare than others with multicolor cells in a nice pattern being the most sought after. High quality dinosaur bone has a hardness of 6-7 on the Moh’s scale. Top grade gem dinosaur bone is eventually going to become impossible to get because, as you might have guessed, they aren’t making it any more. Ring style #M200. The price shown is for men's ring sizes from 7 to 11. All sizes larger than 11 will be an additional charge to cover wax work and extra silver. Contact me for details. Please read our policies before ordering!